Hasselback potatoes and sweet potatoes are a special treat for the eye and the palate. Stumbling across a recipe for hasselback cajun chicken was a new and intriguing idea. Sometimes one doesn’t have everything on hand for a new recipe and that means it is time to play with it and make your own version. No green bell pepper. No andouille sausage and no cajun seasoning nixed the original recipe. Yellow and zucchini squash, red onion, a poblano chile pepper and an assortment of chile powders seemed like good way to try hasselbacking a chicken breast, but with a southwestern flair. Roughly 50+ miles east of El Paso off I-10 is Fort Hancock, TX. It is a community of about 1,750 people in a green farming band along the Rio Grande in contrast to the sand, creosote and mesquite desert on the eastern side of the interstate. 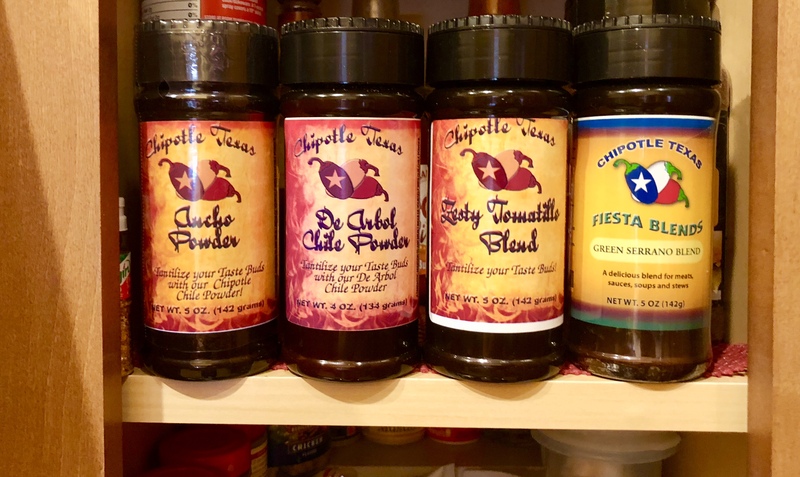 It is home to a modest trading post that has been in the same family for more than 100 years and to Chipotle Texas, a chile company that produces some wonderful chile powers and blends that make it worth a stop for several different kinds. My newest flavor blend is a Zesty Tomatillo Blend that is a bit on the mild side but has a wonderful complex flavor. Experimenting with it us an ongoing adventure. Visiting the store is a treat or you can also check out their website, www.chipotletexas.com and shop online. The company now takes credit cards. Not too long ago, they would take your check for mail orders but wouldn’t ship your order until the check cleared. It is great that they have grown enough to be able to accept credit cards. If you are a chile fiend, do yourself a favor and check it out. Hasselback is a term for making narrow slices almost through a base vegetable or meat, rubbing it with oil and seasoning it or inserting something into the cuts and then roasting it. The easy way to make the cuts is to put a chopstick or pencil on either side of what you are slicing to prevent your blade from cutting all the way through. Putting things into the cuts with out breaking the vegetable can be delicate work. 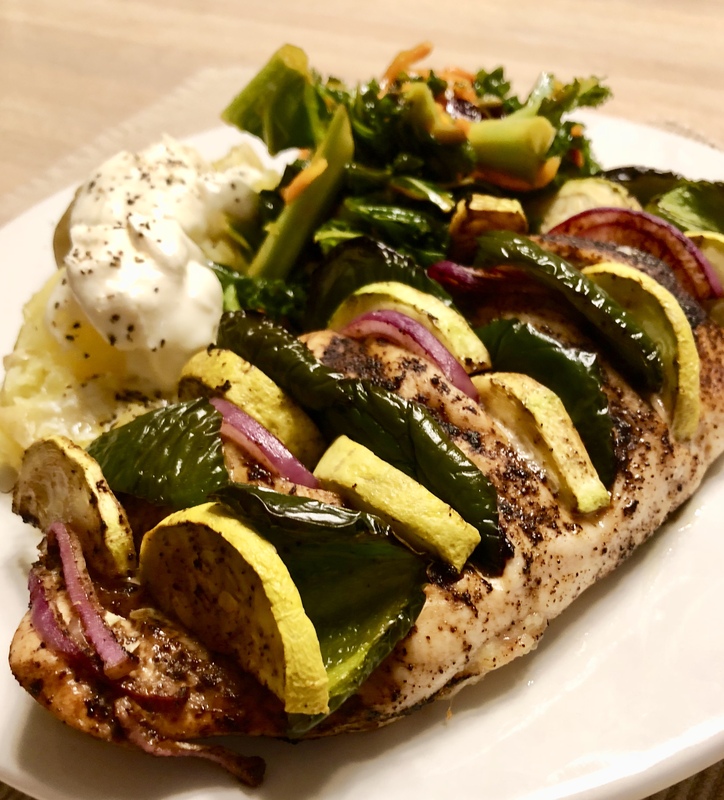 Below is the southwestern version of hasselback chicken stuffed with slices of poblano chile, red onion and squash. The Tomatillo Zesty Blend coated the chicken and was sprinkled in the cuts. It was mild and very tasty, but not quite spicy enough for my taste. Next time a little hotter chile powder will be added to ramp it up a bit. The chicken breast was cooked about 20 minutes at 450º on a foil lined baking sheet. A few chile powders and blends in the spice pantry. Southwestern Hasselback Chicken stuffed with squash, red onion and poblano chile and season with a tomatillo/chile blend. Served with baked potato and a kale salad.